The real Summer is back in the saddle, and disagreements about flying kites ensue. But seriously, Happy Father’s Day to all you father types out there. Jeffrey also shares some info about more goodies from the secret Vorlon memorabilia stash. Deep Geeking: This week, Tim and Summer delve into “Learning Curve”, and Tim admits that while he likes this episode, there are a few dramatic elements throughout the story where the cliches fell flat for him. Was it pacing? Timing? Something else entirely? 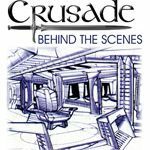 Discussion: Listener Mike Y throws out the suggestion that Crusade might be able to continue in audio dramas; Sean admires the B5 related in-jokes that Jeffrey has been incorporating into the Go To Meeting ads, and would desperately love it if JMS could join Tim and Summer in Deep Geeking on “Sleeping in Light”. 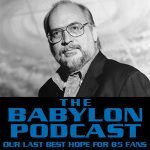 Summer recounts the story of discovering some items of interest on her final stash of VHS tapes, including the Sciography episode for the original Battlestar Galactica, and an episode of SF Vortex featuring JMS, Harlan Ellison, and Herb and Yvonne Solow. Mike from Charlotte tries to defend Zima. We don’t know why. Way to go Jeffrey, you really came through. This episode really felt tacked on to the series. It would have made a great episode for Legend of the Rangers, but as a B5 episode it seemed out of place. Other than some small development for Lochley, and a too staged exchange between her and Garabaldi, I don’t think this episode did much to advance the storyline, or the primary characters. Re: the “Adventures of Apocalypse Al”, the radio drama was completed but it never was put on the air. That’s the one. Now, how do we go about getting *that* production released for public consumption? That might be difficult since it’s an odd format – Twenty 5-minute episodes. It’d be great to get on CD, though. As Tim explains it, the post happily ever after aspect of Season 5 has begun to intrigue me, but this episode falls short. I can’t help but wonder what type of episode would have filled its place had Claudia not left. I was a little surprised Summer couldn’t (or at least didn’t) fill folks in on Juneteenth. Understandably, it’s a bigger deal among African-Americans than among Caucasian-Americans. Season 5 is my least favorite year as it is I think with most fans. This is to me one of the best of the season. Mostly, we see what happens to and the results of the actions by the mature, experienced people in charge. This story breaks that and presents things from a different perspective, so that by itself, whether you love the story or not, is enough to set it apart. Isn’t it in the same mold as the one about the maintenance guys? Huh… I suddenly feel undereducated. I honestly don’t ever recall coming across Juneteenth in my history studies (and I did a lot of independent study on lots of esoteric ethnic subjects of personal interest to me, ranging from African-Americans in the Old West to the African-American/Native-American connections amongst the Southeastern Tribes). If I’d known when Jeffrey mentioned it, I would have said something! I had never heard of Juneteenth even existing before the reference here. I would have thought that the date of the Emancipation Proclaimation would have been celebrated more so than Texas’ repudiation of slavery, but it does make for an interesting history lesson. Mo – hurry up! The shuttle is leaving without you!! Mo are you including the live feed in your listening, or just the finished podcasts? I’d start catching up, Season 5 is almost half way over! I’m almost current now! Up to this one, 160. I have to also agree with Tim. I’m a newbie to the show and when I heard the ‘Sheridan & Lochley were married’ routine I think I screamed out loud. Way too soap opera for me. 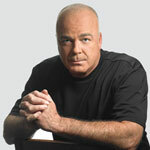 Gary, I’ve never had time to figure out how to do the live feed because I’ve been trying so desperately to catch up. But I’m almost there!